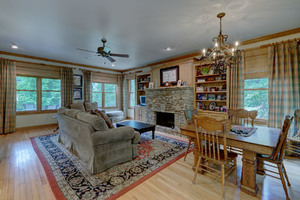 Staging Highlands NC homes adds value. It has been shown that on homes that have been staged capture a hire price, on average, than those that have not been staged. When a home is for sale the plan is to attract as many buyers through the front door as possible. The more buyers who walk in the front door the more likely you are to receive an offer. Staging sets your Highlands NC home for sale for success by helping it look its absolute best. Staging means different things for different homes. Some homes merely need a little cleaning, de-cluttering, and organizing. Other homes need the furniture rearranged or new furniture. Others need art strategically placed. Regardless of what is needed the premise is the same. The goal is to show off the spaces in a home which means making them appear as spacious as possible and as useful as possible. When you decide to sell your Highlands NC home taking the time to prepare it for sale is important. The more appealing your home is the more offers it will attract. Let your Highlands REALTOR walk through your home before you start showing it to ensure it appears its best. Contact our team at Berkshire Hathaway HomeServices Meadows Mountain Realty today to learn more about selling Highlands NC real estate. We welcome the opportunity to update you on current market conditions while sharing a complimentary listing presentation at the same time. Let our knowledge and experience serve as your guide to staging Highlands NC homes and getting your home sold! Click here to read “Study: Staging Could Lead to 10% Price Boost” from REALTOR Magazine.